Get reimbursed for veterinary bills if someone or their dog hurts or kills yours. The law, sample letters and other important tools. 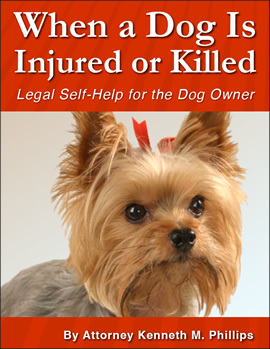 Powerful self-help for dog owners, written by "the nation's best known practitioner of terrier torts" (Los Angeles Times). Law and Strategy - the law in plain and simple terms, and the strategy to make a winning case. Liability Wizard - when a dog has been injured by another dog, this asks you questions and provides tailor-made legal advice based on your answers. Accessed online with a password, it's the closest thing to sitting with an attorney. Pre-written Letters and Forms - powerful documents to make the guilty party and his insurer pay what's fair, and if necessary to prepare you for small claims court. "Dear Mr. Phillips, while we were taking our regular walk up the street, my 8 month old puppy was almost killed by another dog. During the week my dog was in the hospital, I heard nothing from the owner of the other dog. No apology, no offer to pay the huge vet bill. He did call, however, after reading a letter I crafted from the model you provided in your book. Now he is very sorry and will cover all the costs. Thanks for showing the way to get someone to do the right thing." It will be on your computer and ready for use just one minute after you click the "Buy Now" button, below. This is an electronic book that you read on your computer (you'll get an email message with a download link). No waiting because it's not mailed to you.